This is a very early Compton, originally installed in 1927 at the Rialto Cinema, Leytonstone, London and was a 2 manual, 6 rank instrument. The present 3 manual console and additional pipe ranks were added by Compton in 1931 and the organ was fairly well-used up to 1956, the last year it was regularly featured. After that date it seems to have had very little use. In 1973 it was purchased by Father Gerard Kerr and removed to St Mary’s Church, Hornchurch, Essex and, following restoration and modifications, it was re-opened there by Andrew Fenner on August 1st 1976. From then on the organ was used for church services and there were also regular concerts by popular organists, supported by Father Kerr until he died in 1999. With the passing of Father Kerr the organ was offered for sale to be replaced by a modern digital instrument. 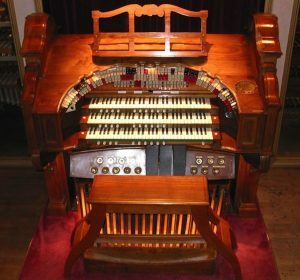 By now showing signs of severe wear, the future of the 72 year old organ looked bleak as there was talk of breaking it for parts, some enquiries coming from as far away as Australia. Around this time organist Byron Jones got to hear of the Compton and paid a visit to Hornchurch to try it for himself. Having been impressed by what he found, certainly in terms of future potential, he made an offer which was accepted by the church and started making plans to disassemble the Compton and transport it to Bristol. Once home it went into storage in Byron’s garage and, piece by piece, was transferred into his music room which was to resemble a workshop for the next 3½ years as each part was meticulously stripped, cleaned and restored before being put aside again until a new home could be found for it. During restoration all of the low pressure additions made in the church were removed and the organ was returned to as near original condition as possible. The specification had included both Krumhorn and Clarinet stops synthetically derived from other ranks and these have been replaced with genuine Krummet and Clarinet ranks. All pipe-work was cleaned, damaged pipes repaired and missing pipes replaced. The organ has had an almost total re-leather and re-wire and a solid state computer system replaces the original relay. The restoration and installation team were: Byron Jones, Terry Ahearn, Gordon Haley and Bob Ball. In 2001 an agreement was reached with the Eden Grove Methodist Church in Filton, Bristol, to house the organ in the church hall. Chamber construction started in late 2001 and installation of the various units began in mid 2002 and took approximately 8 months to complete. The blower was in place and running by September and the console arrived in November. It should be noted that 7 of the 8 original ranks that left the Rialto are still present in the organ (the second string being a replacement) and that none of them have been re-voiced. Instead, the organ has received very careful regulation, both pipe to pipe and rank to rank, to ensure the best possible blend and quality of tone in this 150 seat hall.